This is a smaller version of the Neo Skagit Leech. It is not a mini, hence the name bijou, smaller, elegant version. It is tied on a FS SENYOS ARTICULATED SHANK 25MM BLACK and is lightly weighted with some 1.5 inches of medium lead wire wrapped around short shank (this is needed for all the materials, weighted enough to make it swim optimally, great movement). 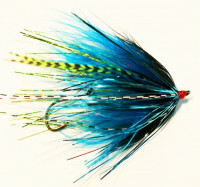 Fly is 2 inches, long but with some trailing material may drag it out to 2.5 inches. Stinger - trailing hook extends back with mono. Hook can be replaced. Size 2 Owner SSW hook.